Remy was purchased in May of 2002. At that time he was between 6 and 8 weeks of age. At first, even though he was left alone in the yard during the day, he got to sleep in the house at night and go places with his new owner. But as Remy got older and more active (as puppies are prone to do), he was relegated to the yard more and more -- still within sight of his family through the glass when they were home, but alone and isolated from the world, behind high walls. Remy became destructive. Lawn chair cushions became playthings. Anything left within his reach was something to be chewed. For lack of something to do or someone to spend time with, Remy howled and barked to let the world know of his loneliness. As the months went by, he escaped from his prison several times and wandered the neighborhood, barking and lunging at whatever or whomever came his way -- no collar or tags to help him find his way home, but he always did, and the loneliness continued. Eventually someone did hear Remy -- "Aunt Jane" heard him! During the day while his owner was at work, she would let Remy come and spend the day with her in her office, which backed to Remy's home. But, when it was time to leave each day, or when she could not have him in the office, Remy was returned to an empty yard to await his owner's return. In August 2002, another friend came into Remy's life and it was love at first sight. 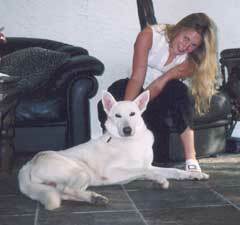 Lara started taking care of Remy, sometimes staying with him for days at a time when his owner was out of town. Finally Remy had someone to fill up those empty hours and the loneliness in his heart. Together they would go for 2-3 mile runs/walks and even did some hiking. Once used to the trails, Remy could be trusted off lead and would stay within 2-3 feet, if not right by Lara's side. In November 2002, Remy's owner left on an extended business trip, and Lara offered to stay in the house to take care of Remy full time. They went on many walks and runs together during this time. Remy was put on a regular feeding schedule, got to sleep in the house again and even worked on some obedience. He finally had a home life! So, for most of his puppyhood, Remy depended on friends to take care of him -- Auntie Jane during the workweek (if Remy's owner was not home), and on weekends Lara was there for him. Remy really had a lot of people who loved him! But even the best of friends are no substitute for their own family when it comes to German Shepherds. 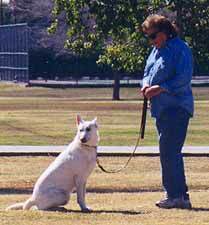 In February 2003, Lara started obedience classes with Remy. Once a week they would head off to PetsMart. Unfortunately, since Lara did not live with Remy, the obedience lessons were not continued or reinforced at home during the week. Remy did graduate from the training program as he was so smart and so willing to please, he only needed a little work beforehand to perform the exercises he needed to do in class! In the Spring of 2003, a lady moved in with Remy's dad and Remy was allowed to sleep indoors, had toys to play with, vet visits, "better" food. Life was good for Remy. In October, a neighbor's small dog (8 pounds) somehow got into Remy's yard and later died of internal injuries. After that, things just seemed to go downhill for Remy as his "reputation" in the neighborhood grew. In January 2004, Remy's owner was taken to court by a neighbor because Remy had "barked and lunged" at him while out walking his small dog. After an evaluation by an excellent trainer who testified in court that Remy could be rehabilitated, along with the testimony of his many friends, Remy moved on in search of a new life in March 2004. 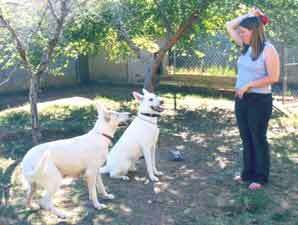 Thanks to a concerned, dog-loving neighbor, White German Shepherd Rescue was contacted to see if Remy could be accepted into our rescue program. Remy has his evaluation with Steff on March 6th -- and passes!! Steff hands over the "reins" to our second evaluator and trainer, Bert. Remy's first days in foster care are spent in settling in, making friends and getting to know the rules. Of course, thanks to Katherine, there's plenty of time for ball playing as well. Last weekend, two of our evaluators recommended that Remy be accepted into WGSR. He is now in a foster home, surrounded by other dogs, teenagers and knowledgeable, caring people who will ensure that he extensively socialized, loved and trained. Remy will not be available for adoption until we are confident he is ready. Meanwhile, he's gonna be a busy boy! We will post his progress on an ongoing basis. 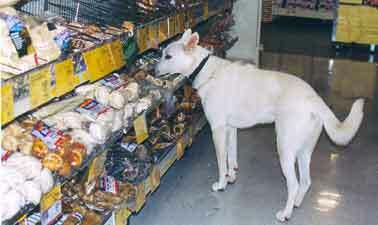 UPDATE 3/7/04: Through the generosity of one of Remy's many guardian angels, he was treated to a shopping spree at Petsmart, where he picked up some of the things he'll need to start his new life. Thanks, Mel, for helping Remy get a fresh start. UPDATE 3/12/04: Remy has spent his first week settling into his new foster home. He is adjusting well and is picking up on the "house rules" very quickly. We have discovered that he is crate trained and knows some basic obedience commands. He loves to play ball, gets along very well with the other dogs, but unfortunately HATES the cat! He's a happy boy. 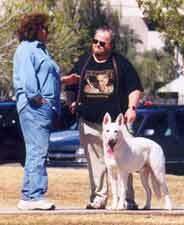 UPDATE 3/13/04: Remy had his first socialization session in the park today. He was initially wary of any strangers, but soon settled down and started enjoying the outdoors and the fresh air. He was taken through a play area teeming with noisy kids playing volleyball, soccer and basketball, and didn't even flinch. He even enjoyed playing on the kiddie play equipment--confidence building stuff to which he responded beautifully! He's making strides at home as well and is building up his muscles and stamina, but still is not very accepting of strangers, no matter where he is. One step at a time, Remy. UPDATE 3/19/04: This has been a week of "playtime" for Remy -- at least he thinks it's playtime, but he's really learning some very valuable lessons, the most important of which is how to live in the outside world. He's been to a very busy park almost every day this week, both during daylight hours and at night. 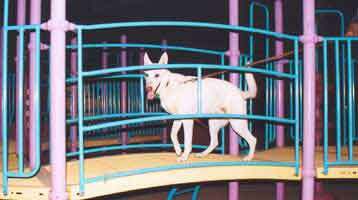 He's having so much fun playing on the play equipment, that he thinks it's his own private playland. 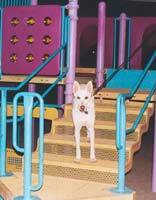 Up the stairs, through the mazes -- he loves it all and forges on without hesitation. He's still not happy with strangers -- not fearful, just too quick to say,"KEEP AWAY." 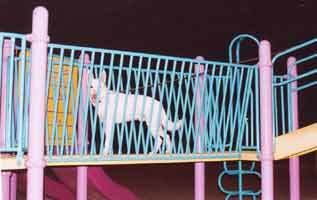 On Tuesday, the park was teeming with people -- children on bicycles and swings and digging in the sand, joggers running by, people walking dogs and sitting at picnic tables. Remy took it all in and was still happy to be at his favorite park. He even allowed a strange lady to come right up and touch him, but the young man whizzing by on the scooter was definitely something to be barked at! There were also a few dogs there which Remy thought deserved a good barking, but he quieted quickly when told "no." On Thursday, a man, older woman and child approached us and asked to pet Remy. We quickly told them his story as Remy stood quietly by, just watching. The older woman tried to approach and Remy initially growled, but once we stood and talked to her for a while, he actually let her approach him and pet him several times without protest. Definitely a big step for him! His obedience work is improving with each workout and, as his confidence grows, Remy will be closer and closer to being ready for adoption. UPDATE 3/25: Remy went to PetsMart last night. We were anticipating nervousness and possible negative reactions to people, which seem to be a source of problems for Remy, but what we got was a happy shopper! 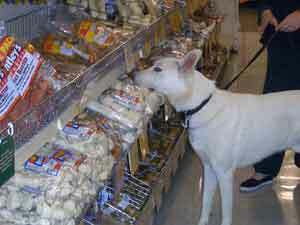 He visited almost every aisle and sniffed at each and every item on the toy shelves. He tried to climb into the lap of one of the PetsMart employees, and then put his front feet up on the checkout counter when he recognized her again! We were totally taken by surprise at Remy's positive and happy attitude and are very encouraged at his progress. His obedience continues to improve daily as he responds more and more positively to gentle guidance and structure and just a whole lot of loving. If he keeps this up, he'll be ready for adoption in no time! We'll be exposing Remy to different situations over the coming weeks and when there are no negative reactions from Remy, we'll start taking applications for his forever home. UPDATE 4/1: Another trip to PetsMart tonight for Remy with his trainer and foster mom. We chose a time during the evening when we knew the store would be busy with lots of shoppers and an obedience class in progress. For the most part, Remy was a happy camper and greeted people with a wag and a smile. A black lab on his way to class decided he didn't like Remy and challenged him, and Remy responded. After correction, however, Remy was taken back to the area where the lab was attending class and while the lab continued to challenge him, Remy walked calmly with his trainer around the entire circle of dogs (including the wildly barking lab) without hesitation. After being challenged by the lab, however, Remy's demeanor seemed to change slightly as he shifted back into what we call his "stranger danger" mode. He initially challenged several other dogs who approached him, but after correction greeted each one of them and "said hello" without any trouble at all. After being at PetsMart for over an hour, Remy showed us he'd had enough as he growled slightly at several people who tried to approach. Again, after correction, Remy modified his behavior and came out of his protection mode. He's slowly learning to relax and enjoy life, one person or dog at a time, and we're seeing improvement almost every day. His obedience work is improving with each session. In June, Remy met his forever family and was adopted on the spot. He now shares his family with another of our rescues, Sassy. Please see our successful placement pages for pictures of Remy and his new family.